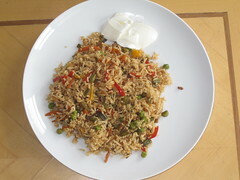 Vegetable Fried Rice is my first entry and I hope its a good one to post. This is an easy dish which can be done in less time.All that we need is old cooked rice because it will taste good than freshly cooked rice.Nothing matters if fresh rice is used but rinse the cooked rice with cold water to make the rice grains separate. Chop the Onion and other vegetables. Heat oil in a pan and add gingergarlic paste and onions and fry them well. Add beans and fry well for few minutes and add carrots and capsicum. Fry them well and spray some water to avoid sticking in pan. Fry till vegetables become tender,say for about 15 min. Add frozen peas and salt and mix it well. Add the vinegar and above said sauces one by one and saute it well. If it needs to be spicier,then add greenchilli sauce. Its optional. 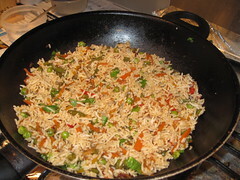 Let it be cooked for 5 minutes and add cooked basmathi rice.Mix it well. Hope all would like it . Please let me know your comments. Your food looks amazingly delicious i hope its when cooked too,the picture you have posted tempts to cook it. 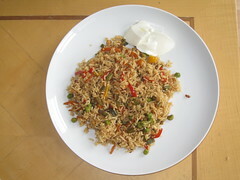 cook ths fr me whn u come to IND..
when u come IND..cook ths 1 fr me..
try t and lemme know ur comments ..